Cheatgrass has many ways that it has adapted over the course of its invasion! We will look at several of them, but I am sure I did not catch them all. One of the adaptations is believed to be the ability of the grass to crossbreed. Being able to do this allows for the plant to adapt to different environments and in turn increases its range of invasion. Unfortunately for the plant, due to its self-pollination, it has high levels of inbreeding (Zouhar 2003). Another adaptation this plant has developed is the ability to produce in a vast array of climates and also stay dormant in the soil for two to three years, but could be more than five years. 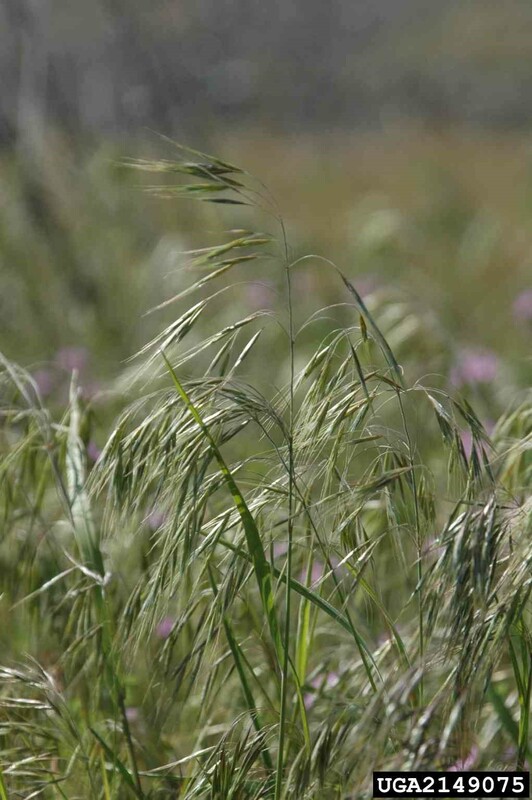 Bromus tectorum can survive in warm, cold, wet, and dry conditions. It has been found in places from salt-desert shrub communities to coniferous forests. It is believed that the habitat is a main contributor in the adaptive genetic variation that we see around the world (Zouhar 2003). However, Cheatgrass is more likely to invade areas that have the same climate as Eurasia, its native habitat (Forest and Range 2006). This invasive species has also developed a rapid growing root system that rapidly occupies underground space and competes with other species’ roots for resources (Zouhar 2003 and Liu 2013). Like most grasses, the roots of Bromus tectorum are fibrous and provide support for holding the plant up in the soil (Forest and Range 2006). This root system also helps decrease the amount of erosion that is happening to the surrounding land (Forest and Range 2006). The roots of this grass are typically made up of seven main roots that divide quickly in all directions (Zouhar 2003). The roots are usually more concentrated in the top twelve inches of soil, but they have the capability of penetrating up to sixty inches or more (Zouhar 2003). To show how adaptive they are let’s look at what temperatures they can survive in. Cheatgrass is an annual winter plant, so with its fall germination and winter growth it has to be able to withstand some pretty cold temperatures. The timing of its reproduction is controlled by the short lived seed banks that B. tectorum has (Dyer, Hardison, and Rice 2011). Even with its short lived seed bank though, the plant manages to grow through freezing temperatures. The roots of Cheatgrass continue to grow at thirty-seven degrees Fahrenheit (Zouhar 2003), while roots of other plants, such as bluebunch wheatgrass, that are in the same area as B. tectorum remain dormant until temperatures closer to fifty degrees Fahrenheit (Zouhar 2003). This adaptation to climate allows Cheatgrass to take over. However, this invasive organism cannot with stand everything; it has a weak point once temperatures reach closer to ninety degrees Fahrenheit (Zouhar 2003). This invasive species moves around and gets to other places to invade in many ways. A large quantity of seeds is produced during the plants growing time, winter. After the seeds are produced they can be spread short or long distances. Wind and water do not help the seed travel far, but they move it enough to help the plant take over. To travel longer distances, B. tectorum has adapted and developed barbed florets. These florets make the seeds easy to be picked up by humans or domestic or wild animals by catching and sticking to clothing, feathers, or fur (Zouhar 2003). There is also a possibility that vehicles or machines are kicking up some seeds and taking them with them or the possibility of it being stored in a farmer’s barn in dry bales of straw or hay (Zouhar 2003). In 1966, Cheatgrass was confined to higher elevations; since then, it has adapted and is now found in lower elevations too (Zouhar 2003). Its fastest invasion occurred after a herd of cattle was introduced to the fields where it was growing and were left to roam and graze the lands. What this did was push out the native plants that could not keep up with the heavy grazing, which allowed B. tectorum to take over (Zouhar 2003). When this grass takes over, there is a huge increase for the likelihood of fires (Zouhar 2003). As of now, people say that after the first fire occurs it only takes three to six years for the fuels from Cheatgrass to build up and cause a second fire. This fuel comes from the seed banks and buildup of dry material (Zouhar 2003). It is then easily ignited when the conditions of weather and wind are just right. As more and more fires occur, the native species that initially inhabit the area no longer do because they cannot adapt fast enough to keep up with the blazing flames. Cheatgrass tends to dominate in areas that have experienced a recent fire and once it had claimed its new territory the chances of wildfires just continue to rise (Zouhar 2003). This adaptation to and promotion of frequent fires is what gives Cheatgrass its greatest advantage against other competitors (Zouhar 2003).